Today, March 13, 2016 Louis KABAYIZA was officially inducted as new archdeacon of Hanika. These ceremonies were marked by the presence of the Bishop of Shyogwe, Dr. Jered KALIMBA, Archdeacons, Pastors, Nyanza District leaders and many Christians from all over the diocese. Jesus is the only real Good shepherd by Excellency, and none can be a God shepherd unless if she/he received God’s Power. The sheep recognizes the shepherd by his voice. The archdeacon has to be a God shepherd. But first of all we may ask ourselves who the archdeacon is. 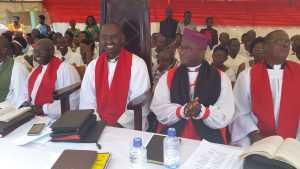 The archdeacon is the chief of deacons and a deacon himself is a servant. Those who have called themselves: the sheep goes away from such peoples! Those who have been called by the church leaders: the sheep die because of them because they only look for their own interests. Those who have been called by God: they accept even to die for the cattle. They fight for the cattle. They accept to fight Goliath to save the honor of the cattle. We need such persons. We need David to kill Goliath for us! But who is really ready to do so? If the Bishop is not ready, the Archdeacons must be there to fight! If they are not able, Pastors must be there! If none of us is ready to fight for the cattle, God will use someone we don’t know. We don’t need to be pastors only in peaceful times: think about being a pastor in war, in genocide, etc. we don’t also need to be pastors for rich and good people only. 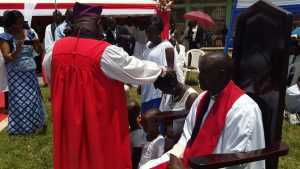 The Pastor/Archdeacon receives all birds, all people! Everyone has his own role in the Church. Every part of the body prays a crucial role for its health. Let us go and find all God’s people and we are not alone as God provide with us with so many tools. None se Abacidikoni bo nta ngofero n’ inkoni babaha ko ndaba Rev. Kabayiza nta ngofero afite. Oya nta ngofero n’inkoni babaha.